Nowadays, most developed and even developing countries are facing increasing need for trained health-care facilities such as hospitals, emergency departments, and other health services centers. Providing diverse and complicated health services will require more human resources. Human resources play a main role in providing optimal health services to the community, and in fact, are critical factors affecting the effectiveness and efficiency of health systems. But in recent years, increasing demand for high-quality health services has led to an increased pressure on human resources planners to allocate the optimal number of health workers in different businesses and different geographic areas, and simultaneously, promote the desirable population coverage. Human resource allocation in wrong numbers or wrong proportions or inappropriate geographic areas can lead to a bad effect on the quality of service provision, an increased dissatisfaction among customers, and even staff. Ultimately, it can be an obstacle to the achievement of the organization's main goals. Hence, it seemed that the essential need of health organizations is to estimate the optimal number of employees to ensure effective and efficient use of limited resources. On the other hand, workforce, as the most important resource in provision of health care, account for the largest part in the health sector's expenditures, therefore, in most developed countries, the issue of human resource planning (HRP) has been paid lots of attention. The core of HRP is to estimate and predict the number and types of human resources needed to achieve the organization's goals. Neglect of HRP leads to many problems, such as shortage or surplus of workforce, unequal distribution of workforce, severe shortage of staff in rural or deprive region, inappropriate applying staff, nonproductive employees, and so on in the organization., Therefore, an objective estimation of staff is the most efficient, effective, and acceptable step on human resource management that will facilitate the achievement of fair and desirable health-care goals. However, for years, it has become possible to achieve a rational approach to allocate appropriate levels of human resources to health centers. In recent decades, developing countries have used demographic ratios to estimation of their staff needed, which often result in excessive workforce in some place and a reduction in other place. 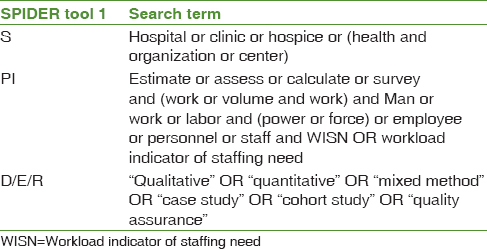 In the late 1990s, the World Health Organization (WHO) provided the Workload Indicator of Staffing Need (WISN) methodology for estimating the needed staff. This method is based on a human resource management tool regarding the actual work done by the staff. Using the workload indicator to determine the required human resources will lead to the establishment of a new evidence-based workforce norm. Some concerns and critics on this methodology have been aroused during application of WISN; so, this methodology needs to be reviewed broadly after more than four decades. At scoping review the main goal is to achieve a deep insight of subject by literature review not the critique of previous studies and ranking them in the range of the best and worst conducted studies. Therefore, reviewing the studies were. Hence, the aim of this study is to scoping review of the recent 10-year studies on the WISN as a tool or model for estimating human resources needed to provide desirable services using the proposed method by WHO's based on actual workload in health-care organizations and in different countries in order to identify the strengths and weaknesses of the methodology and propose the solution for limitations. WISN is based on the actual workload performed by the staff and the standard (time) activity for each component of the work. This principle has long been used in business. In the health sector, however, it was not applying until the late 1990s, when the WISN method was used in a number of countries. The manual of WISN is a revision of version that was prepared by Peter Shipp and published by the WHO in 1998. This method is an easy to use operational tool for estimating and forecasting the human resources required in HRP. What Is the Workload Indicator of Staffing Need? Assessing the workload of staff. Determining the number of staffing need based on the actual workload. A realistic approach that its outcome use to budgeting and resource allocation. The WISN calculation is based on the type of services and the complexity of care delivery in different centers. Two types of results differences and ratiosare provided by the WISN method. The difference between the actual number of staff with calculated number which indicates the level of deficiency or excessive staff is the result of the using WISN. The actual staff ratio, compared with the required staff, represents the pressure on personnel. In the recent years, many studies have been done on the WISN as a methodology, model, or tool for estimating staff needed. Due to a large number of articles in this issue, the search strategy was limited to the period of 10 years from 2007 to 2017 [inclusion and exclusion criteria mentioned in [Table 1]. All articles that their method was WISN were chosen to including to the study. Keywords consist of workload, WISN, health-care staff, health centers, and hospitals [search strategy mentioned in [Table 2]]. The databases that were used for search included Medline, Google Scholar, Scopus, and PubMed as well publications such as Elsevier, Emerald, ProQuest, and Springer. The search result was the extraction of 367 articles that after omitting the repeated and nonEnglish articles, 99 eligible articles (regarding to including criteria) were chosen. Our scoping review, focus on health-care workers, workload, and estimate of staffing need, so articles that were not eligible exclude from the study. Furthermore, because of concentrate on the main aim of the study, some study that their objectives were about high workload hazards and its correlation with increasing human error, staff, and patient's dissatisfaction were excluded. Studies that applying WISN but not in health-care organizations were excluded. 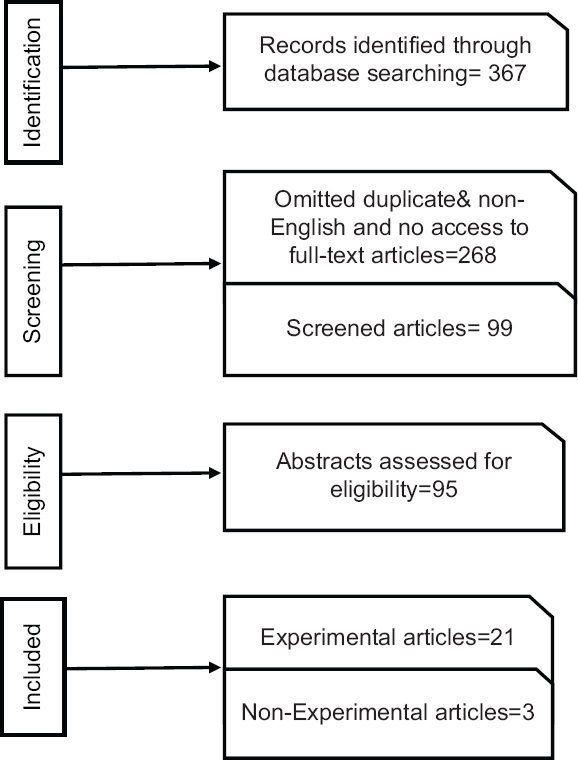 After screening removal of duplicates, and addition of snowball studies, 31 empirical articles were selected for inclusion and concepts analyses. [Summarizing the selection process drawn up [Figure 1]. After ultimate review, chosen articles assessed by matrix method that is an approach for organizing, critical, and analyzing articles. A scoping review aim is achieving the broad vision to one issue not for put critical comment on the best articles. Hence, researchers review the articles away from criticism. 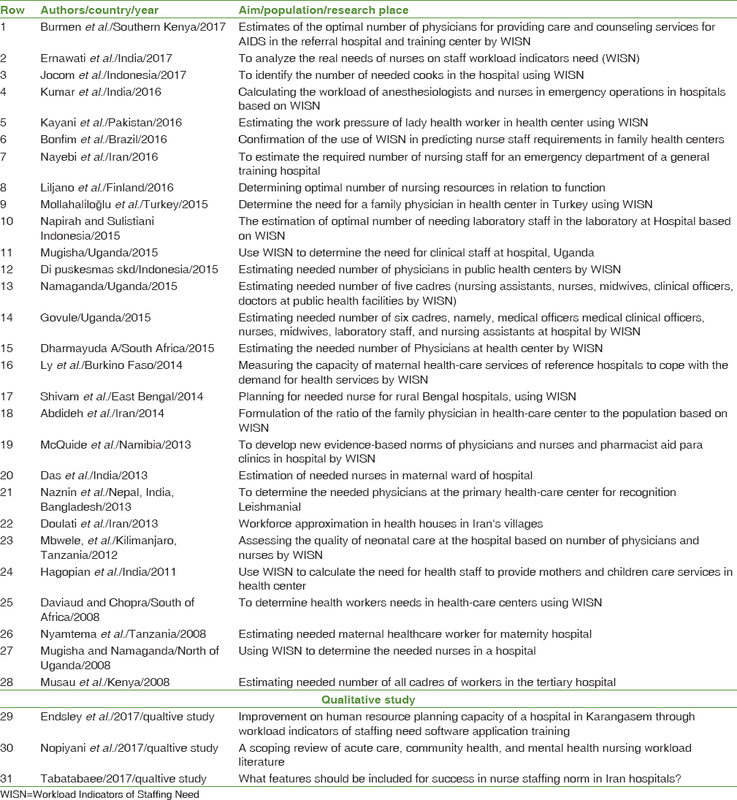 Ultimately, 31 articles that their aim were estimating of needed workforce by WISN in health organization chosen for content analyze. [Table 3] is a summary of extracted articles base on country, population, year, and their aim. 12 studies was done in Africa (Tanzania, Namibia, Burkina Faso, and Uganda), 4 studies in India, 4 in Indonesia, 3 in Iran, and 1 in Turkey, Pakistan, Bangladesh, Bengal, Finland, and Brazil. 3 of 31 was qualitative study and others were carried out by cross-sectional method. Out of 31 studies that ultimately remain for the analysis of data, 10 of them in hospitals and on different clinical or nonclinical staff was done. The studies target population were nurses,,,,,,,, physicians and pharmacists, laboratory staff, anesthesiologists,, and hospital cooks. In addition to the above-mentioned points, the strengths and weaknesses of the WISN, as well as suggestions for solving the problems, were also extracted and summarized briefly below. Helping to hold training courses for managers and decision-makers about estimation of staff based on real workload: WISN is applicable to all kind of staff. Literature review shows that the result of applying customized WISN can used to improve the distribution of staff among different regions, providing the essential information for training plans, and allocation of staff among different regions. Participation of managers: The WISN cannot be right tool unless support strongly by managers. On the other hand, WISN cannot be used lonely for decision about distribution of staff. For example, in areas such as African countries, where geographical conditions are crucial for the survival of workforce, supportive management, and informed HRP could lead to a fair distribution of human resources. The effect of changing health environment on WISN outcomes: Given the changing environment and its impact on health programs, such as emerge new tasks and services should be considered in the calculation of human resources and the norm obtained should be reviewed as far as possible. Taking into account the work shift, the geographical area in terms of demographic characteristics, deprived and remote areas, and specific diseases of the region, local people's customs, and other factors that leads to more or less favorable benefits of each health center's health services while using WISN. Use combined statistics to calculate staffing need: Given the fact that the time needed for the first visit (need time to take medical history or some essential information) can be different from other visits, it is better to use the average time of services. Concerns about fair distribution of workforce within and between service institutions rank high in seeking how best to respond to challenges. The health workers who actually deliver health services are the most precious and least readily available resource in a health system. Managers at national and local levels struggle daily with how to manage them and simultaneously increase their effectiveness, in this way they can achieve a more just distribution of workload and productivity. The WISN method is applicable to any health-care organization, and of course, in smaller institutions, it can be done more quickly and efficiently. In large and advanced institutions could be applied to sub-elements of organization, such as a ward in tertiary hospital. WISN can be used to calculate the required human resources for future models based on some assumptions such as the results of staff training, demographic changes, and disease profiles and staff turnover. It is suggested that the WISN calculations be updated every 2 or 3 years, but by taking into account the cost-effectiveness of this revision. The components of work should be reviewed every 5 or 6 years to ensure that current operating standards are up-to-date and changes made over time, for example, if an organization uses a policy of staff turnover, or added a new task, the WISN should be recalculated. We are immensely grateful to Dr. Vahid Rasi for his useful comments on an earlier version of the manuscript. We also thank Dr. Kamal Gholipour for his kindly assistance in summarizing the study and editing of the final text. Kakuma R, Minas H, van Ginneken N, Dal Poz MR, Desiraju K, Morris JE, et al. Human resources for mental health care: Current situation and strategies for action. Lancet 2011;378:1654-63. Boxall P, Purcell J. Strategy and Human Resource Management., Mrtin S Press LLC, UK: Palgrave Macmillan; 2011. Berman EM, Bowman JS, West JP, Van Wart MR. Human Resource Management in Public Service: Paradoxes, Processes, and Problems. 4th Edition, London, United Kingdom, Sage; 2012. Bahadori M, Ravangard R, Raadabadi M, Mosavi SM, Gholami Fesharaki M, Mehrabian F, et al. Factors affecting Intensive Care Units nursing workload. Iran Red Crescent Med J 2014;16:e20072. Zangane M, Omrani A, Shahabi M, Alikhani M, Gharlipour Z, Imanzad M. The nurse manpower distribution at state hospitals of Iran by Lorenz Curve and Gini index during 2001-2006. Sci J Ilam Univ Med Sci 2013;21:174-81. Clements A, Halton K, Graves N, Pettitt A, Morton A, Looke D, et al. Overcrowding and understaffing in modern health-care systems: Key determinants in meticillin-resistant Staphylococcus aureus transmission. Lancet Infect Dis 2008;8:427-34. Van Bogaert P, Clarke S, Willems R, Mondelaers M. Nurse practice environment, workload, burnout, job outcomes, and quality of care in psychiatric hospitals: A structural equation model approach. J Adv Nurs 2013;69:1515-24. Neuraz A, Guérin C, Payet C, Polazzi S, Aubrun F, Dailler F, et al. Patient mortality is associated with staff resources and workload in the ICU: A multicenter observational study. Crit Care Med 2015;43:1587-94. World Health Organization. Applying the WISN Method in Practice: Case Studies from Indonesia, Mozambique and Uganda. World Health Organization; 2010. World Health Organization. Models and Tools for Health Workforce Planning and Projections. World Health Organization; 2010. Namaganda G, Oketcho V, Maniple E, Viadro C. Making the transition to workload-based staffing: Using the workload indicators of staffing need method in Uganda. Hum Resour Health 2015;13:89. World Health Organization. Workload Indicators of Staffing Need. World Health Organization; 2010. World Health Organization. Workload Indicators of Staffing Need (WISN): selected Country Implementation Experiences. World Health Organization; 2016. Satish N. Gap analysis in staffing using workload indicators of staffing need method in a tertiary care teaching hospital. Int J Sci Res 2015; 4:376-7. Das S, Manna N, Datta M, Sengupta D, Samsuzzaman M, Baur B, et al. A study to calculate the nursing staff requirement for the maternity ward medical of college hospital, Kolkata applying WISN method. IOSR J Dent Med Sci 2013; 8:1-7. Mbwele B, Reddy E, Reyburn H. A rapid assessment of the quality of neonatal healthcare in Kilimanjaro region, Northeast Tanzania. BMC Pediatr 2012;12:182. Mugisha JF, Namaganda G. Using the workload indicator of staffing needs (WISN) methodology to assess work pressure among the nursing staff of Lacor Hospital. Publisher: Department of Health Sciences of Uganda Martyrs University. Vol 6; Edisi 1; Hal 1-15. Health Policy and Development Journal, 2008;6:1-15. Ernawati NL, Nursalam N, Djuari L. The real need of nurses based on workload indicator staff need (Wisn). J Nurs 2017;6:85-92. Shivam S, Roy RN, Dasgupta S, Das Bhattacharyya K, Misra RN, Roy S, et al. Nursing personnel planning for rural hospitals in Burdwan district, West Bengal, India, using workload indicators of staffing needs. J Health Popul Nutr 2014;32:658-64. Liljamo P, Lavander P, Kejonen P. Determining optimal nursing resources in university hospital nurse staffing. Nurs Inform 2016;2016:3. Nayebi BA, Mohebbifar R, Azimian J, Rafiei S. Estimating nursing staff requirement in an emergency department of a general training hospital: Application of Workload Indicators of Staffing Need (WISN). Int J Healthc Manage 2017;17:1-6. Desy A, Syawal S. Analisis Beban Kerja Dokter Umum Menggunakan Metode Workload Indicators of Staffing Need (WISN). Ilmiah Mahasiswa Kesehatan J. 2016;1:250-73. Dharmayuda A. Workload analysis of doctors at puskesmas using workload indicators of staffing need in denpasar. Publ Health Prev Med Arch 2015;3:20-6. Napirah MR, Sulistiani AO. Analysis of the optimal number of staff needed using workload indicator of staffing needed (WISN) method in laboratory unit of public hospital anutapura palu. Public Health Indonesia 2015;1:190-205. Govule P, Mugisha JF, Katongole SP, Maniple E, Nanyingi M, Anguyo R. Application of workload indicators of staffing needs (WISN) in determining health workers' requirements for Mityana general hospital, Uganda. Int J Public Health Res 2015;3:254-63. Jocom PA, Massie RG, Porotu'o JP. Kebutuhan riil tenaga pemasak di instalasi gizi dengan menggunakanmetode workload indicators of staffing need (WISN) di RSU Pancaran Kasih GMIM Manado. J Biomed 2017;9:58-66. Ly A, Kouanda S, Ridde V. Nursing and midwife staffing needs in maternity wards in Burkina Faso referral hospitals. Hum Resour Health 2014;12 Suppl 1:S8. Kayani NS, Khalid SN, Kanwal S. A study to assess the workload of lady health workers in Khanpur UC, Pakistan by applying WHO's WISN method. Athens J Health 2016;3:65-78. Mollahaliloğlu S, Metin BC, Kosdak M, Üner S. Determination of family physician need with workload indicators of staffing need method in Turkey. Prevention 2015;49:53. Abdideh M, Jannati A, Asghari Jafarabadi M. Standard development of family physicians to the population defined by WISN. Bull Env Pharmacol Life Sci 2014;3:89-96. Doulati SP, Shahgoli JF, Jahanbin H, Kousha A, Tabrizi JS. The assessment of needed workload for manpower approximation in health houses in Iran's villages. Eur J Sci Res 2013;114:139-48. Hagopian A, Mohanty MK, Das A, House PJ. Applying WHO's ‘workforce indicators of staffing need’ (WISN) method to calculate the health worker requirements for India's maternal and child health service guarantees in Orissa state. Health Policy Plan 2012;27:11-8. Daviaud E, Chopra M. How much is not enough? Human resources requirements for primary health care: A case study from South Africa. Bull World Health Organ 2008;86:46-51. Bonfim D, Laus AM, Leal AE, Fugulin FM, Gaidzinski RR. Application of the workload indicators of staffing need method to predict nursing human resources at a family health service. Rev Lat Am Enfermagem 2016;24:e2683. Burmen B, Owuor N, Mitei P. An assessment of staffing needs at a hiv clinic in a Western Kenya using the WHO workload indicators of staffing need WISN, 2011. Hum Resour Health 2017;15:9. Naznin E, Kroeger A, Siddiqui NA, Sundar S, Malaviya P, Mondal D, et al. Human resource assessment for scaling up VL active case detection in Bangladesh, India and Nepal. Trop Med Int Health 2013;18:734-42. Endsley P. School nurse workload: A scoping review of acute care, community health, and mental health nursing workload literature. J Sch Nurs 2017;33:43-52. Nopiyani N, Suarjana I, Januraga P, Muliawan P. Improvement on human resource planning capacity of a hospital in karangasem through workload indicators of staffing need software application training. Udayana J Soc Sci Humanit 2017;39-42. Tabatabaee SS, Vafaee-Najar A, Amiresmaili MR, Nekoie-Moghadam M. Nurse staffing norm in Iran hospitals: What features should be included for success? Int J Prev Med 2017;8:13. Willcox ML, Peersman W, Daou P, Diakité C, Bajunirwe F, Mubangizi V, et al. Human resources for primary health care in sub-Saharan Africa: Progress or stagnation? Hum Resour Health 2015;13:76. Nyamtema AS, Urassa DP, Massawe S, Massawe A, Lindmark G, Van Roosmalen J, et al. Staffing needs for quality perinatal care in Tanzania. Afr J Reprod Health 2008;12:113-24. McQuide PA, Kolehmainen-Aitken RL, Forster N. Applying the workload indicators of staffing need (WISN) method in Namibia: Challenges and implications for human resources for health policy. Hum Resour Health 2013;11:64.